Widespread visitor but breeding is probably under-recorded. 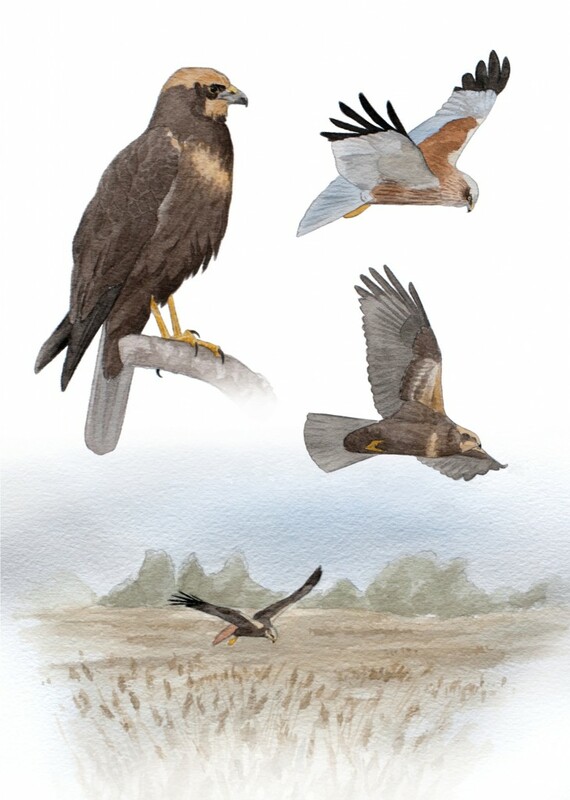 The Marsh Harrier is the largest and darkest of the European harrier species and lacks the white rump seen on other harriers. Adult male plumage is similar to the male Hen Harrier but with a chestnut belly and chestnut upper wing coverts. Adult female plumage is uniformly dark brown with a creamy-yellow head crown and often a pale patch on the breast. Juveniles of both sexes have a similar plumage to the adult female. The Marsh Harrier is a generalist predator and its mostly aquatic diet includes small birds, mammals, reptiles and amphibians. Its preferred habitat is lowland freshwater and brackish wetlands with extensive reedbeds and it nests on piles of reeds surrounded by dense marshy vegetation. Some individuals may migrate to Africa in September and October although there are sighting records of this species throughout the year in Northern Ireland.